Water is life. When scientists look for signs of life in the universe, the first thing they look for is water. Over 50 percent of our bodies is water. We can live only three days without it. It is not just science. The importance of water is enshrined in religious beliefs. According to Book of Genesis, water was included in the first of God’s creations. Jews practice ritual bathing. Christians enter the faith by a baptism of water. Cleansings with water are a purification practice in Islam – but, wisely, using too much water is considered wasteful. Buddhists use water for purification and in ceremonial offerings. To Hindus, water itself is holy, with seven rivers being especially sacred. Water is often used as a metaphor by Taoist teachers – a lesson on effortless flow, on adaptation, on weakness having astonishing strength (e.g., the erosion that can be caused by a slow stream of water). One of the main symbols associated with Confucianism is the Chinese character of water, thought to signify the source of life. Why then, with water embedded in both our cells and our souls, are we so irresponsible about its use? There are some areas of the world where water is deeply appreciated – areas where women walk hours every day to carry enough water back to their homes for daily use. But here in the developed world, we treat water as if it were an infinite resource. It is not. It is actually a rapidly diminishing resource. In the late 20th century, the world became concerned about “peak oil.” Peak oil is the point at which the maximum rate of extraction of petroleum is reached. After that point, there will be a period of terminal decline as oil reserves dry up. One “solution” was the introduction of corn ethanol as a gasoline substitute. But producing a gallon of corn ethanol can consume up to 300 gallons of water. This century brought the growth of hydraulic fracturing (fracking) and the decline of the theory of peak oil. Fracking is the high-pressure introduction of water (and toxic additives) into the ground to release trapped oil and natural gas. Many who have lived in regions where fracking is common have complained about contamination of their well water. But the real issue may be that fracking consumes nearly 10 million gallons of water for a single well – water that is contaminated by the process and becomes forever unusable. Essentially we are trading a resource we need for a resource we want. It’s not just oil. As the population grows, so does the need for food and the water required to grow it. Most of the major aquifers in semi-arid or arid zones are experiencing rapid depletion due to agricultural use. In the United States, the problem is especially acute in California. There are expected to be a billion more mouths to feed less than a decade from now and that will require another trillion metric meters of water per year. Prolonged drought has also contributed to water scarcity. The Colorado River Basin has lost 53 million acre feet of fresh water in the past dozen years. Most of the southeastern states are under conditions of extreme or exceptional drought. As I am writing, eastern Tennessee is recovering from an enormous wildfire due to dry conditions. The disappearance of water is a global issue. 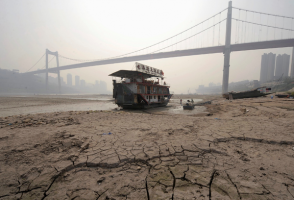 China has lost half of its rivers in the last 20 years. Water scarcity is approaching emergency conditions in Iran. The aquifer supplying the capital city of Yemen will be dry by the end of this decade. Water use is highly variable but increases with income. Some poor populations get by on 3 gallons of water per person per day. Twelve is considered the necessary minimum for reasonable health. Americans consume the better part of 200 gallons per person per day. The global middle class will more than double by 2030 resulting in much higher personal water consumption. According to one forecast, only 10 years later there will not be enough water on Earth to supply the population if current water use practices continue. Climate change has been a part of the political agenda for a number of years and rightly so. But the onrushing water crisis is largely ignored. Some individuals are conscientious about water use including taking shorter showers, Some even capture gray water or create rain gardens. But individual efforts are far from enough. Water conservation must be enshrined in public policy. In public health, there is a model known as “health in all policies.” This means that every policy in every area must be examined for its health effects. We could use “health in all policies” as a model for “water in all policies.” Every public policy should be evaluated for its effect on water supplies. How much water will it cost to build this development, grow this crop, build this school? How can we make it cost less? Can we do it in a way that will capture usable water? If we need more guidance, we can ask the elders of Standing Rock. Author: Burden S Lundgren, MPH, Ph.D., RN practiced as a registered nurse specializing in acute and critical care. After leaving clinical practice, she worked as an analyst at the Centers for Medicare and Medicaid Services and later taught at Old Dominion University in Norfolk, Virginia. Presently, she divides her time between Virginia and Pennsylvania. Email: [email protected].